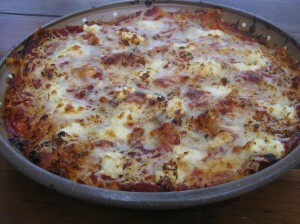 This entry was posted on Tuesday, June 30th, 2009 at 6:54 am	and is filed under Gluten-Free Recipes, Seasonal Foods. You can follow any responses to this entry through the RSS 2.0 feed. You can leave a response, or trackback from your own site. Sounds fantastic, Melissa! I’ll definitely be giving it a try this week if we end up with a ton of kale again in this week’s CSA box. The only change I will probably make is to replace the ricotta with cottage cheese. Horrifying, I know, but it’s a personal preference for lasagna. Look for kale, lettuce, garlic scapes, beets, rhubarb, etc. Similar to last week. Do you have a small share (small meaning big)? I don’t make lasagna often because I don’t eat much pasta and such, but the kale and mushrooms go so well together. This really was good, even if I’m not the best lasagna assembler. I’m going to try something new with the garlic scapes tonight. I’ll keep you posted. I know what you mean! We opted out of doing a CSA this year… choosing, instead, to grow some of our own produce AND made regular trips to the farmer’s market. So far, so good. Some weeks, we’re still inundated with produce (since my eyes are often bigger than our stomachs), but it’s been a bit more manageable. That said — you can always stow some of those great greens away in the freezer, if you can’t use them all up! Looks like a fantastic use for all those greens to me! 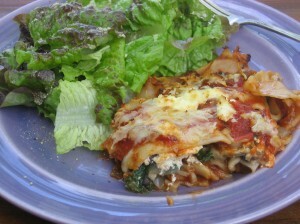 We’ve been making layered “Mexican” casseroles with ours — corn tortillas, greens, cheese, and sauce. SO GOOD. Yay – greens! Your take looks yummy as ever, Melissa. I like the round pan. And I know what you mean – the feeling of not wanting anything to go to waste from the CSA while meanwhile, you’re wondering who can eat all that food?! Wish we could share meals over the internet. In terms of abundant greens, I think a juicer helps (think green lemonade with kale, lemon, celery and green apple) as does a blender for whipping up green smoothies. Then you can have your greens at breakfast, lunch and dinner! Wow, that looks so good. I don’t usually miss cheese but that would taste great. Love your recipes! Sorry about your rhubarb, but good thing it’s pretty hearty and withstands alot. Just curious, have you ever heard of DePuma’s Gluten Free Pasta out of Connecticut? I’ve heard really good things about them. Sorry, this probably doesn’t really fit here but I’m just curious to know if anyone has heard of them? We have a small share – and you’re right, it’s big! We picked up yesterday and got two heads of lettuce, spinach, curly leaf kale, scapes, collards, parsley, cilantro, turnips, rhubarb (which I traded for extra scapes to make more of your pesto) and three kohlrabi bulbs. I don’t have the faintest idea what to do with the kohlrabi, so I’m hoping you’re planning on posting one of your fabulous recipes (hint, hint). 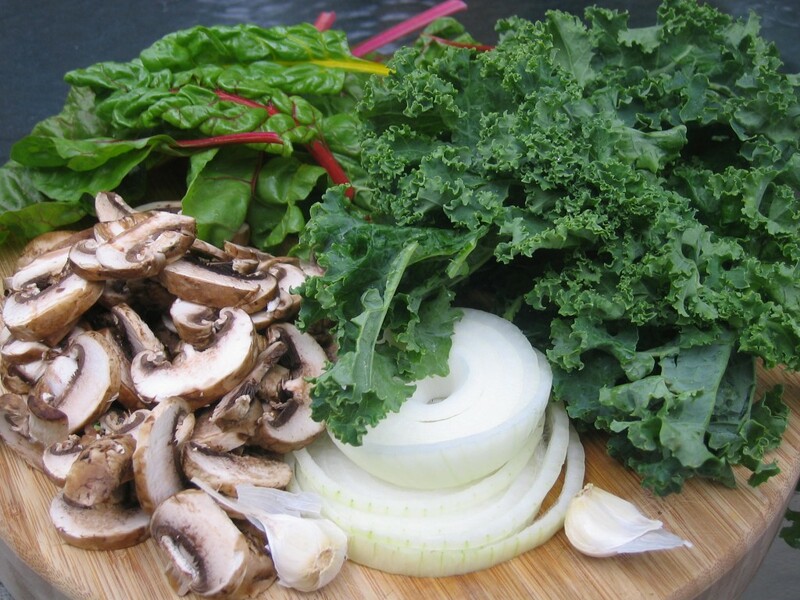 I like the idea of juicing the greens – brilliant! I’ll head to Target on my lunch break and grab a juicer. Layered Mexican casseroles sound wonderful. I like all these greens lightly sautéed with other veggies (and even fruit) that I forget about baking them in a casserole. I threw in the lasagna recipe for a change. Your Mexican fare fits into that category. Thanks for the inspiration. I’ll try something with corn tortillas. Sounds good! I’m not surprised that we’re on the same page with the greens! I do juice them with beets, ginger, apple, carrots — whatever I have around. I’ll post one of my favorite recipes. Good idea. I also eat greens for breakfast, lunch and dinner and encourage my clients to add green smoothies into their diet. It’s such a yummy and good way to eat greens in the summer. You can also make smoothie popsicles out of them. Add a little goat yogurt and you’ve got a green dessert treat! Thanks for the comment. I’ve missed you! Thanks — I appreciate your input. I do so much better without dairy, too, but every so often I fall off the wagon. I’m pretty good at knowing my limits though. Yes, it’s hard to resist these gooey casseroles! It’s nice to “meet” you and after checking out your blog (love the rhubarb theme), I know we’ll reconnect! I love rhubarb and am going to try a new recipe today. Yes, it is hearty stuff, isn’t it!? Welcome and no problem with dropping the plug for the GF pasta company. Are you the brother or something? Those of us who don’t eat wheat are always on the lookout for new and good companies. I had never heard of that one, so thanks for the tip! I’ll look into it. Yes, those red boxes sure are big for small shares! I didn’t get kohlrabi this week, but I did get collard greens and more baby beets (which I’m addicted to) among other things. I will do a kohlrabi recipe soon though. A rhubarb and another garlic scape recipe are on the docket right now. Juicing and smoothies are such a good way to add greens to your diet, boost your health and put a dent in that big red box of veggies! Hi Melissa. Sheila from Grant Farms here. Great to meet you at the Botanic Gardens last weekend. Thank you for sharing these amazing recipes and great ideas with us. Inspiring! After reading everyone’s praises about your garlic scape pesto, I’m going to make some this weekend. Happy 4th of July! Thanks so much for stopping by and leaving a comment! I made some ice cream from the rhubarb yesterday — oh my gosh, was it ever good. Thanks for providing me with such good ingredients to start with! It’s hard to go wrong with produce from Grant Farms! Wow, the CSA season is sparking your writing, and no mistake. You turning literary backflips at the moment, a sort of blogging version of Damien Walters’ acrobatics! Absolutely superb recipe, I’ve had loads of dried lasagne sheets in my cupboard for an eternity and never felt the urge to break them out…. until now. Great stuff! This CSA season is unreal! I have such a load of produce that I’m constantly experimenting. I’d be happy to share all this with you if you and the rest of your gang we’re so far away! See you this morning at Wimbledon! That looks really good, Melissa! Speaking of mushrooms, I’ve been reading lately that you should never eat mushrooms raw … are you aware of that guidance? and, can you offer more info? Mr. GFE loves raw mushrooms in tacos and on salads. Are raw mushrooms really good?????????? Sounds sick but i tried it it totally ROCKED. Another great way to make this gluten free would be to use polenta instead of brown rice pasta. That’s how I’m going to make it tonight!